Hello everyone! I’m Tammy, and I’m excited to have this opportunity to share with you today here at Minds in Bloom! While most of my experience has been in teaching fifth grade, I currently teach third and have been teaching since 2004. Although I teach all subjects, I have a passion for teaching science. I love creating hands-on and engaging lessons and activities. When I first began my student teaching, I could not wait to get into the classroom and work with those cute little kiddos. It was their passion to learn, their burning curiosity, and their intense imaginations that made teaching exciting. I loved that moment when their faces lit up and they grew excited because they finally understood something. Over the years of teaching, that still gently reminds me that that is why I’m a teacher: Knowing that I can make a difference in at least one child’s life; the ability to create a life-long learner with a passion for education. The overall demands on teachers can sometimes creep in and overshadow that feeling. For me, it wasn’t so much the long, never-ending to do list, but more of the pressure of fitting it all in. How could I possibly find time for everything, while (unfortunately) still making sure my students did well on the tests? It seemed that ultimately, something got pushed to the back burner, and it was usually the untested areas, such as science and social studies. As I mentioned above in my intro, I have a passion in science. I tried only doing science for 25 to 30 minutes a day. I tried teaching science and social studies every other day. I tried alternating every nine weeks between science and social studies so they could get equal and decent time but that was not working. I just wasn’t satisfied. I really didn’t feel comfortable with how much I was not teaching the students. It felt like a disservice. I felt like I was somehow dishonoring a teacher’s code. I spent my next summer really digging into research trying to figure out just how I could make this work. I read articles online, I bought way more books on Amazon than I should have (I always do! ), and I even took a trip over to the local college to read up on some journals. I was a woman on a mission. I wanted to find time to teach science – oh yeah, and social studies too! After much research I was finally able to implement it! I was not immediately successful. I want to be upfront about this. It took time, but each year it got better and better. Now it works wonders in my classroom. I integrate my content in the classroom. However, I flip it around differently than most others. Let me explain. Since I was starting slow with it being my first year trying this out, I chose science (are you surprised?). I started first by sitting down with my science and language arts standards. Instead of determining where I can fit my science into my reading and writing, I did it the opposite way. I paced out my year for science and asked myself, “What reading standards would fit into these science standards?” For instance, I could easily teach cause and effect during the earth changes unit. I could teach main idea and summarizing in nearly any of the units. Nearly any of the nonfiction standards could easily be weaved into the science units. This also applied with the informational writing standards. I even saw a place where I could weave in some opinion writing. I adjusted my times in both reading workshop and in science. I taught science now longer than 30 minutes a day because I was now teaching reading through science. This also made it easier for me to reach that Common Core requirement of 50% nonfiction and 50% fiction (for fourth grade) reading balance. I was teaching students how to read nonfiction texts along with nonfiction strategies, and they had to apply them beyond not only just a book of their choice but also in their science studies. I did slim back my reading block a bit. I still taught reading separately, but the focus was more on fiction studies and providing independent time. This also allowed time for me to meet in small groups or confer. This entire change was actually difficult at first because of the adjustment but extremely powerful in the end! I was so moved by it that I will never teach another way! *Have project-based learning – These activities tend to weave in reading, writing, and math standards. Depending on the subject, they can even weave in science or social studies. *Theme-based or inquiry-based learning – Over the summer consider planning an entire unit (like during your college days!) 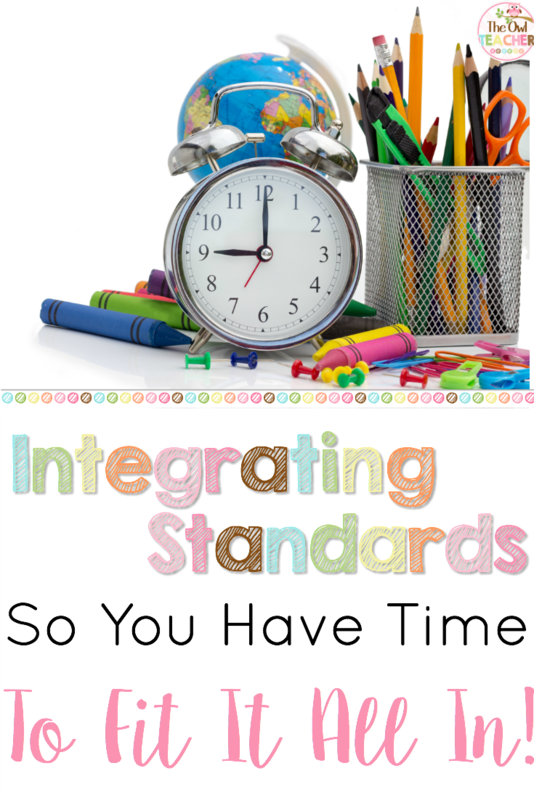 around a theme that covers multiple standards from several subjects. *Weekly Centers – Have one day a week, such as Friday, where you have a center for each subject area that explores the current topics. Try to integrate a bit that way. *Literacy Centers – Have a social studies and/or science center that focuses on your content area topic but also focuses on a literary skill. *Morning Work – Use morning work that focuses on science and reading, such as my Science Picture of the Day activity. 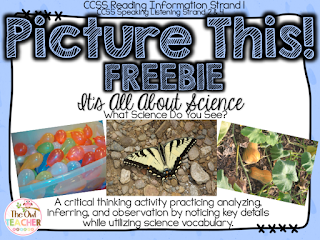 Students have to observe and infer the science in photographs. Check out this critical thinking freebie. *Mentor Texts – Use mentor texts during your reading and math blocks that relate to other content areas as a great connection. *Use trade books, electronic texts, or paired texts to help teach both reading strategies and skills and the science/social studies concepts. It is possible to fit all the standards in and still be able to do what you were born to do – teach! You can enjoy your passion and not be burdened down by the day-to-day behind-the-scenes duties of a teacher. With a little slow-stepping and belief in yourself, you can accomplish integrating content to fit all your standards in. Who knows? You may even find you have free time to investigate the children’s curiosities further! What other ways do you like to integrate content to free up some time? Feel free to share your ideas in the comments below! I love collaborating. A special thank you to Ms. Lynette for allowing me to share my ideas on her blog and with her loyal fans! Tammy is the author of the blog, The Owl Teacher. She enjoys creating curriculum materials that are hands-on and engaging in all subjects for grades 2-5. Her passion is to find creative ways to help students grow while saving time for the teacher. You can visit her Teachers Pay Teachers store to find materials to save you time in the classroom, visit her blog for more great ideas, tips, and freebies, or follow her on Pinterest, Facebook, Instagram, or Twitter. My co-teacher and I have been working toward this goal. Thank you so much for outlining your strategy. You were much more organized in your approach than we have been! 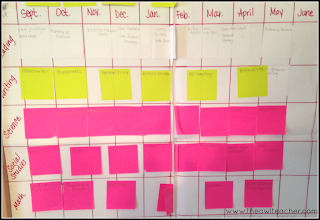 It really does take an enormous amount of pre-planning, but it is totally worth it! It definitely takes time! Start small but know that it is possible!